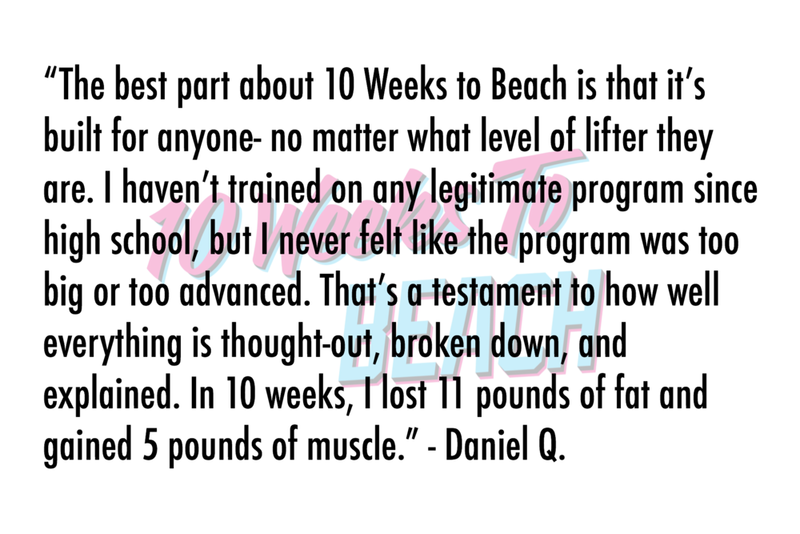 10 Weeks to Beach is a full training and nutrition program designed to help you lose fat, build muscle, and gain confidence. In this ebook, you'll be provided all the tools necessary to look and feel your best at your next big beach trip. After these 10 weeks, you'll not only be ready to take your shirt off on vacation- you'll look forward to it. 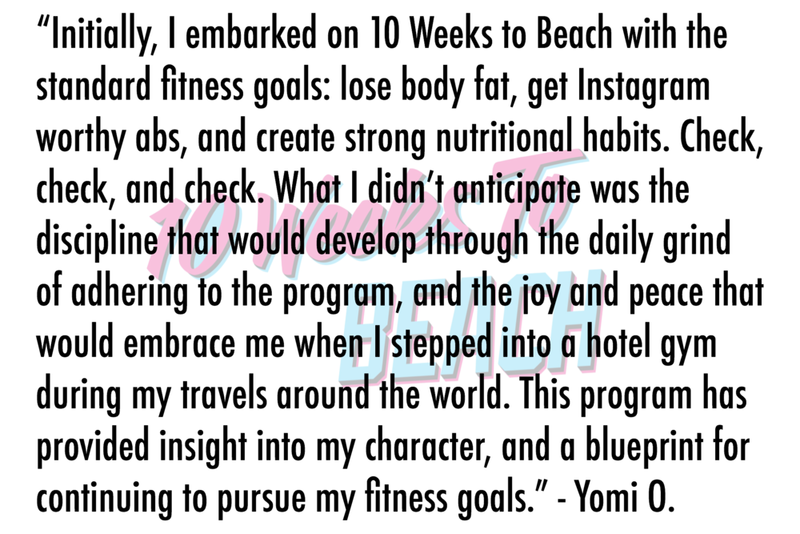 I wrote 10 Weeks to Beach because I saw the need for a practical and realistic fitness program that helps “regular” people get in shape for upcoming vacations. I know the real, sustainable formula to building muscle and burning fat. It doesn’t involve marathon workouts, overly-restrictive meal plans, or magic juices. Rather, it requires sound training programming, proven nutrition guidelines, and consistency. 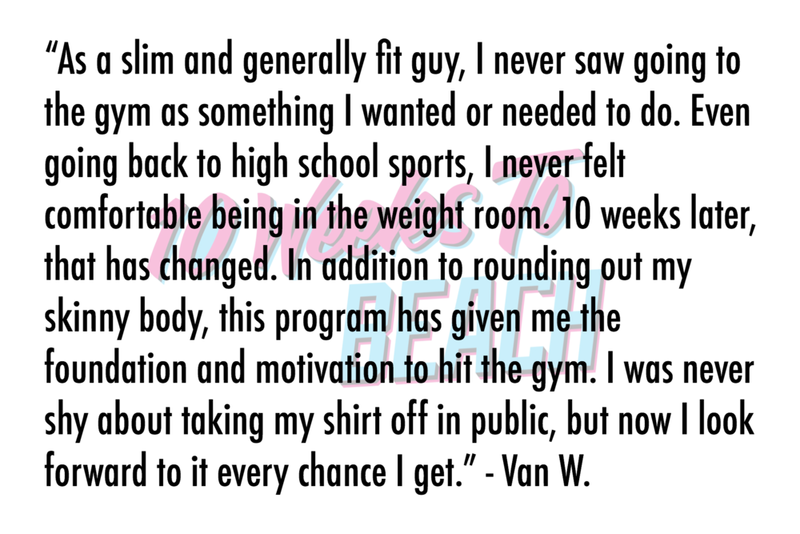 That is exactly what this book provides- a straightforward and attainable approach to fitness that creates real results. 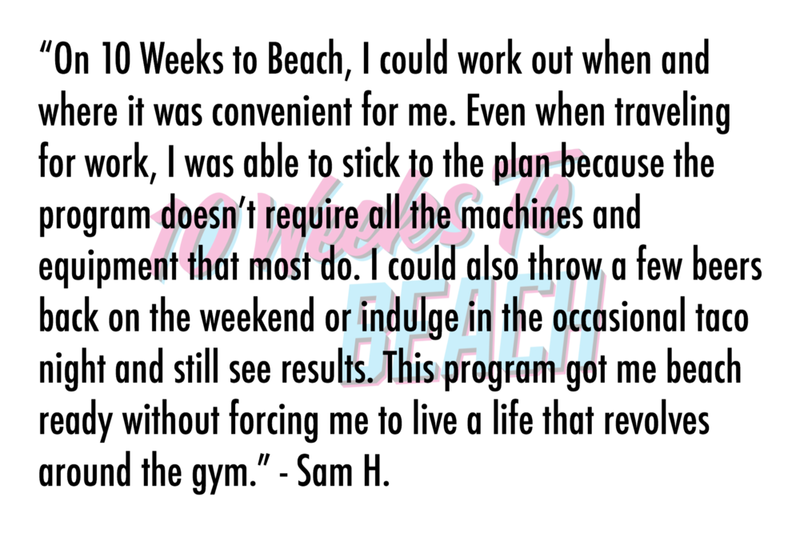 10 Weeks to Beach is for those of you who want to feel confident with your body on your next vacation. It is for those of you who want to enjoy a trip without second guessing your physique on the beach. It is for those of you who not only want to be comfortable taking your shirt off, but look forward to the opportunity. 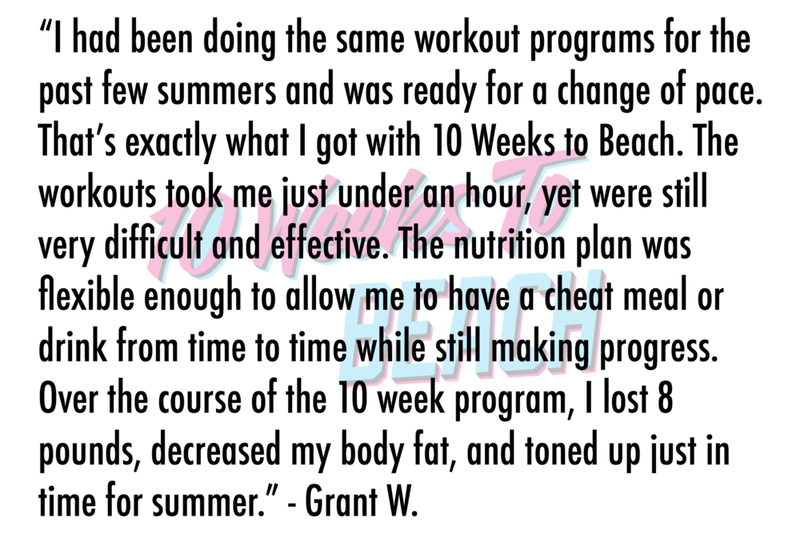 With 10 Weeks to Beach, you will be given the blueprint to your best beach body. You will build muscle and burn fat safely, sustainably, and effectively. 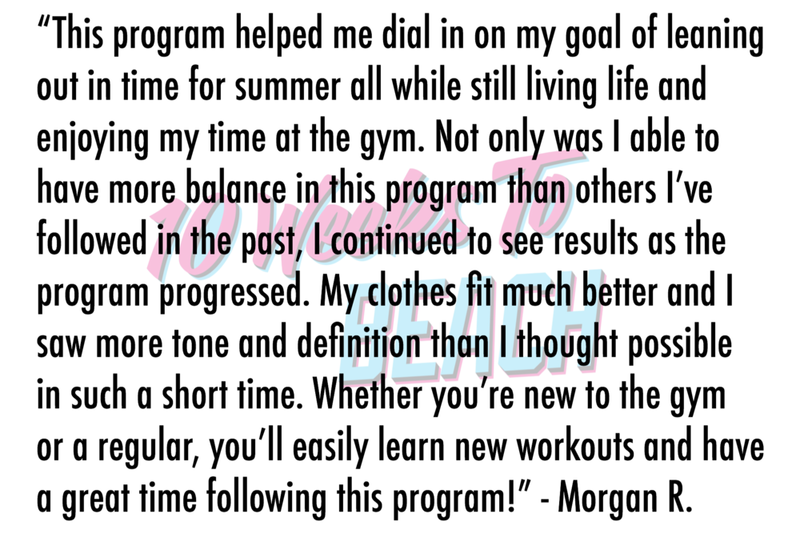 You will learn proven training and nutrition strategies that have produced real results for real people. Be in the gym 4-5 days per week, for no more than an hour at a time. Train each muscle group multiple times per week (upper body/lower body split). Learn advanced training methods such as supersets, circuits, eccentrics, isometrics, and drop sets. Use dumbbells, cables, bands, and bodyweight to build muscle. Zero barbells. Do short bouts of high-intensity conditioning to burn fat. Zero traditional cardio. Set appropriate calorie & macronutrient numbers to reach your goals. Utilize flexible dieting to lose fat without being on a strict meal plan. ARE YOU READY FOR YOUR BEST BEACH BODY?